Hyundai displayed a concept version of the ix25 (shown) at the Beijing auto show earlier this year. LONDON -- Hyundai will sell a version of ix25 subcompact SUV in Europe and the U.S. starting in 2017, a company source told Automotive News Europe. 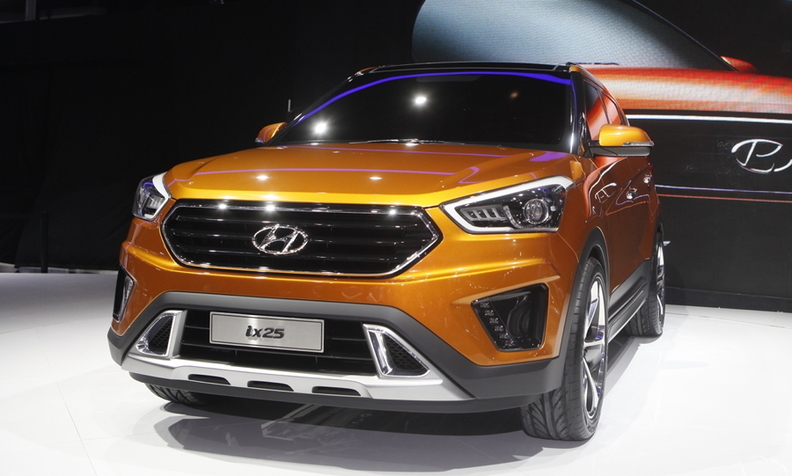 The move would give Hyundai a competitor in Europe’s booming small SUV segment, which grew by 89 percent in the first half to 390,100 sales, according to JATO Dynamics. Full-year European sales for the segment are expected to exceed 500,000 this year and to rise to 1 million by 2020, according to an IHS Automotive forecast. The ix25 has just gone on sale in China, where it also is build. A spokesman for Hyundai Europe said there had been no official confirmation the ix25 would also would be sold in the region. “The car was developed specifically for China,” he said. It is unclear where the ix25 variant for Europe and the U.S. will be built. The ix25 was revealed at the Chengdu auto show in August. It shares a platform with sister brand Kia’s Soul small minivan, according to media reports in China. Hyundai Europe showed a subcompact SUV concept called Intrado at the Geneva auto show in the spring but provided no details on whether there would be a production version. Until the model arrives Hyundai will try to fill the gap with a version of the new i20 subcompact that will have SUV looks. That model will debut next spring, the source said. Currently only Skoda, Renault and Seat offer wagon versions of their subcompact model lines in Europe.